Senan Kilbride hit the net for Roscommon today. ROSCOMMON’S PROMOTION HOPES got a huge boost in Division 2 of the Allianz football league today as they saw off Meath at Dr Hyde Park. Elsewhere it was a good day for the Laois footballers as well as they eased their relegation fears by producing a brilliant second-half fight back to defeat Galway in Tuam Stadium. Both todays games were re-arranged fixtures after they were postponed earlier this month due to snow. There was no weather problems today with Roscommon triumphing at home by 2-10 to 0-14 against Meath while Laois ran out 2-10 to 0-10 victors over Galway. Roscommon went second in Division 2 with today’s win thanks to goals from Senan Kilbride and Cathal Cregg. At the break, Roscommon trailed by 0-6 to 0-5 but the two green flags they raised in the second-half were crucial. Cregg struck 1-1 overall while Diarmuid Murtagh (0-4) and sub Donie Shine (0-2) also made vital scoring contributions for Roscommon. Mickey Newman top scored for Meath with 0-7 while the Royals also welcomed Kevin Reilly and Conor Gillespie back to action. Laois came back from six points down at half-time to defeat Galway. They trailed 0-10 to 1-1 at the break with Peadar O Gríofa (0-4) and Shane Walsh (0-3) leading the way for the Tribesmen. But Galway failed to score in the second-half and finished with 14 men when Damien Comer was dismissed. Done Kingston, who hit 1-5 overall, scored the first-half goal for Laois while Tom Shiels struck the vital second-half goal for the Leinster side. 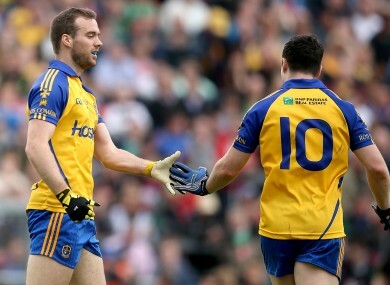 Email “Roscommon beat Meath to boost promotion hopes as Laois come back to defeat Galway”. Feedback on “Roscommon beat Meath to boost promotion hopes as Laois come back to defeat Galway”.